If any of you have ever experienced a speed wobble, you’ll know that it is a time of sheer panic and massive (over) corrections. 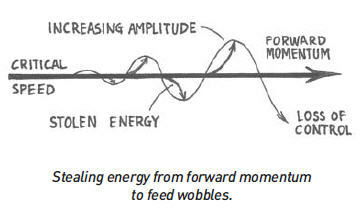 Speed wobbles happen when stability is lost. The simple fact that stability indicates growth and volatility spells panic is what investors rely upon in order to place their bets. That which has been seen in the markets would tend to indicate that with ‘wobbliness’ increasing, the crash may be imminent. A good explanation of the effect this has on markets can be found here.